New Tripp Trapp® Colours Available Now! 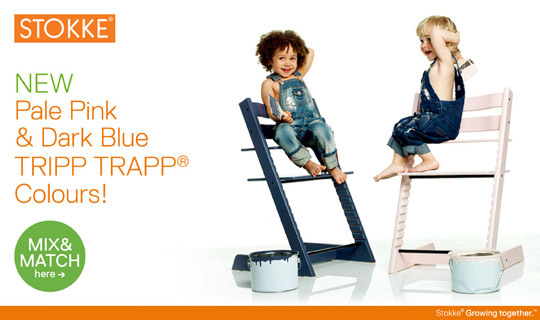 We've been teasing you a little about our new Tripp Trapp® colours - but the wait is over! Grab yourself a cuppa and pop over to the Tripp Trapp® configurator on our main site to create your dream chair! We would love to know what your favourite colours are. Is your dream Tripp Trapp® colour co-ordinated, or do you like to mix and match? I bought my first natural colour Tripp Trapp® 10 years ago (before I worked at Stokke®) and when my girls came along a couple of years later and I stuck with natural and individualised them with different cushion sets. We threw out the traditional adult chairs at least 5 years ago to become a complete Tripp Trapp® family but by then there were 12 colours to choose from! I'm a turquoise girl and my hubby - he's blue! I'm a grey lady, but if I could have my own way I would be a BRIGHT yellow! We have 7 Tripp Trapps in our home, like you, have thrown away the conventional chairs around the dinner table!